Ironically, while the race for developing sophisticated weapons continues and the brutality of armed conflict intensifies across the world particularly in less developed regions - world leaders and thinkers recommend the non-violent path followed by M K Gandhi to address today's frightening challenges. At a recent peace convention in Delhi, 200 delegates - including Prime Minster A B Vajpayee, former heads of State and Government, representatives from political parties, the academia and civil society - from various countries spoke of the importance of Gandhi's ideas towards the fulfillment of a peaceful world order. Non-violence, as practiced by Gandhi, is a weapon not of the weak, but of the strong and fearless. It does not consist merely of abstention from physical injury, but demands a discipline of not even thinking of hurting others. The mindset of people has to be made more pro-non-violence and strong peace movements need to be created in all countries, said the delegates. 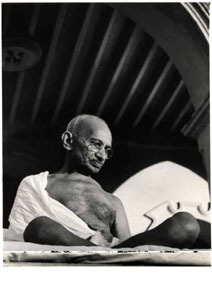 "Mahatma Gandhi lived, worked, fought and died for peace, equality and respect for all human beings, tolerance and respect for all religious faiths and ethnic groups and settlement of differences (whether personal, national and international) by dialogue and discussion," said the Draft Declaration adopted at the conclusion of the 'Global Convention on Peace and Non-Violence'. The convention also called for a culture of tolerance to be inculcated in children from an early age, for which education plays a vital role. Prime Minister Vajpayee said that Gandhiji, like all humanistic thinkers around the world, insisted that violence is not the natural state of human existence. Men and societies yearn for life without violence and their most mundane needs as well as their deepest aspirations can be fulfilled only in conditions of peace, he underlined. "Sometimes, nations may go to war and some groups may fight with each other. But sooner or later, they realize the futility of bloodshed and the utility of dialogue," the PM said at the inaugural session. Combating terrorism and promoting universal brotherhood and harmony among all religious, ethnic, linguistic and other groups was an important theme of the convention organized by Gandhi Smriti and Darshan Samiti and the International Centre of Gandhian Studies and Research. Many believed that with the end of the Cold War a decisive peace would reign marked by a strong sense for internationally enhanced cooperation and reconciliation. Instead, within 12 years, the world has changed again dramatically and new forms of insecurity, clashes of civilization and military armament and power seem to dominate our agenda, observed Dr Richard von Weizsacker, former President of Germany. On the theme of terrorism, Dr Weizsacker stressed the need to build bridges between regions that are shaped by different religions. Observing that separation between political mandates and religious power authorities remains important, he said this had posed difficulties in European history and still remains unresolved in some countries today. According to him, western convictions often prove a lack of knowledge about the history of the non-western world, and this contributes to intolerance. "To pretend that democracy is nothing but a western invention is neither historically correct nor politically wise. The development of democracy goes along with a growing interest for the well-being of other people." "The current international situation marked by violent conflict, ethnic upheavals and escalation of terrorist attacks compels us to listen, as Mahatma Gandhi said, 'to the inner voice' or the voice of reason and non-violence as a means to achieving peace and justice," said Dr Salim Ahmed Salim, former PM of Tanzania, and former Secretary-General of the Organization of African Union (OAU). The Draft Declaration called for strengthening the United Nations, particularly the Security Council, to effectively discharge its responsibility for the preservation of peace and security in the world. In this context, delegates pointed out that the big challenges ahead are not solvable by military means. The Security Council should act along the conviction that the majority of the world population suffers from injustice, their need is for an expression of power markedly different from that of military strength, said Dr Weizsacker. The areas that need to be urgently addressed by the UN are human rights, hunger, education, access to information and a free but fair trade worldwide, he added. The authority of the UN is being put to test today. According to Dr Salim, the current unilateral tendencies to "solve" international problems have ushered in a crisis of confidence in international relations. "We need to restore shaken confidence by reaffirming the sanctity of the UN Charter which calls for peaceful settlement of disputes." Like many participants, Dr Salim reiterated the importance of promoting dialogue and working towards collective action: "The UN remains the only forum within which humanity can promote peace, security and justice for all. It must remain central to our collective efforts in facing and tackling the multitude of challenges and threats that face our planet." The convention held that democracy plays an indispensable role in preventing conflict among nations since it is recognized that democracies do not go to war with one another. It also recommended that those countries that aid and abet terrorist activity be expelled from the UN and other allied organizations. Delegates also called for restructuring the UN so as to reflect the changed equations since the Charter was framed, and combating terrorism by mobilizing strong public opinion. They recommended that the NGO sector and the UN must bring about international pressure for a progressive reduction of all weapons and the achievement of complete disarmament within a reasonable timeframe.